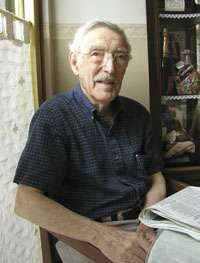 Bruce Nathan Ames (born December 16, 1928) is an American biochemist. He is a professor of Biochemistry and Molecular Biology Emeritus at the University of California, Berkeley, and a senior scientist at Children's Hospital Oakland Research Institute (CHORI). He is the inventor of the Ames test, a system for easily and cheaply testing the mutagenicity of compounds. Ames, raised in New York City, is a graduate of the Bronx High School of Science. His undergraduate studies were at Cornell University in Ithaca, New York, and his graduate studies were completed at the California Institute of Technology. Ames was elected a Fellow of the American Academy of Arts and Sciences in 1970. He is a recipient of the Bolton S. Corson Medal in 1980, Tyler Prize for Environmental Achievement in 1985, the Japan Prize in 1997, the National Medal of Science in 1998 and the Thomas Hunt Morgan Medal in 2004, among many others. His research focuses on cancer and aging and he has authored over 550 scientific publications. He is among the few hundred most-cited scientists in all fields. Ames' current research includes identifying agents that delay the mitochondrial decay of aging, understanding the role of mitochondrial decay in aging, particularly in the brain, optimizing micronutrient intakes in the population to prevent disease, malnutrition, and obesity. He is also interested in mutagens as they relate to cancer prevention and aging. Dr. Ames received more than $650,000 in support from the National Foundation for Cancer Research between 1998 and 2007. In the 1970s, Bruce Ames developed the Ames test which is a cheap and convenient assay for mutagens and therefore potential carcinogens. Previous carcinogenic testing used live animals, and the procedures are expensive and time-consuming. This made animal testing impractical for use in screening on a wide scale, and reduced the number of compounds that could be tested. The Ames test on the other hand uses the bacteria Salmonella typhimurium to test for mutagens, and is considerably cheaper and faster. The Ames test became widely used as an initial screen for possible carcinogens and has been used to identify potential carcinogens previously used in commercial products. Their identification led to some of those formulations, such as chemicals used in hair dye, being withdrawn from commercial use. The ease with which Ames test allows widely used chemicals to be identified as possible carcinogens made him an early hero of environmentalism. Subsequent work in Ames' lab involved looking at an overview of what was mutagenic or carcinogenic, and to what degree. Previously, scientists tended to only look for positive or negative results without considering the magnitude of the effect, which meant that as more and more items were shown to be potentially mutagenic, there was no system for evaluating the relative dangers. He also continued to test various natural and man-made compounds, and discovered that, despite what he and others had assumed, naturally occurring compounds were not turning out to be benign as compared to man-made ones. His continued work eventually led to his falling out of favor with many environmentalists. As natural chemicals turned out to also be frequently mutagenic, he argued that environmental exposure to manufactured chemicals may be of limited relevance to human cancer, even when such chemicals are mutagenic in an Ames test and carcinogenic in rodent assays. He contended that most human genetic damage arises from essential micronutrients lacking in poor diets and the oxidation of DNA during normal metabolism, and that the most important environmental carcinogens may include some whose chief effect is to cause the chronic division of stem cells whereby the normal protective mechanisms of a cell become less effective. He argued against the banning of synthetic pesticides and other chemicals such as Alar which have been shown to be carcinogenic. He was concerned that overzealous attention to the relatively minor health effects of trace quantities of carcinogens may divert scarce financial resources away from major health risks, and cause public confusion about the relative importance of different hazards. Ames considered himself a leading “contrarian in the hysteria over tiny traces of chemicals that may or may not cause cancer", and said that "if you have thousands of hypothetical risks that you are supposed to pay attention to, that completely drives out the major risks you should be aware of." ↑ "Biography and information". CHORI. ↑ Ames BN (February 2003). "An enthusiasm for metabolism". J. Biol. Chem. 278 (7): 4369–80. doi:10.1074/jbc.X200010200. PMID 12496254. ↑ "Book of Members, 1780–2010: Chapter A" (PDF). American Academy of Arts and Sciences. Retrieved 17 April 2011. ↑ Smith, Gerald R; Johnston Mark (February 2004). "The 2004 Thomas Hunt Morgan Medal". Genetics. United States. 166 (2): 645–6. doi:10.1534/genetics.166.2.645. ISSN 0016-6731. PMC 1470756 . PMID 15020453. ↑ "About Dr. Ames". Bruce Ames official website. ↑ "National Foundation for Cancer Research". Neoplasia. 3 (1): 88–90. 2001. doi:10.1038/sj.neo.7900130. PMC 1505022 . ↑ Ames, B. N. (1979). "Identifying environmental chemicals causing mutations and cancer" (PDF). Science. 204 (4393): 587–593. doi:10.1126/science.373122. JSTOR 1748159. PMID 373122. ↑ Ames, Bruce; Kammen H.O. (June 1975). "Hair Dyes Are Mutagenic: Identification of a Variety of Mutagenic Ingredients". Proceedings of the National Academy of Sciences. ↑ Forman, D. (1991). "Ames, the Ames test, and the causes of cancer". BMJ (Clinical research ed.). 303 (6800): 428–429. doi:10.1136/bmj.303.6800.428. PMC 1670593 . PMID 1912830. ↑ Twombly, R. (2001). "Federal carcinogen report debuts new list of nominees". Journal of the National Cancer Institute. 93 (18): 1372. doi:10.1093/jnci/93.18.1372. PMID 11562386. Wikimedia Commons has media related to Bruce Ames.